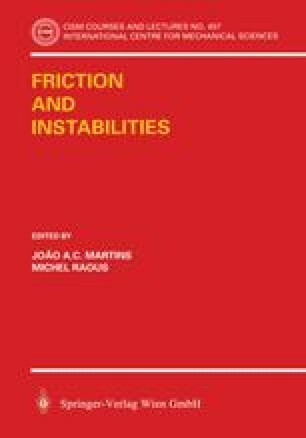 This chapter focuses on the numerical aspects of the characterization of friction-induced instabilities and their dynamic computation for linear and nonlinear problems. We begin by presenting briefly basic formulations and several computational methods for solving unilateral frictional contact problems, in quasi-statics and dynamics, and in elasticity and hyper-elasticity. The above specific dynamic formulations will be used to compute the flutter solutions presented in the last sections. Numerical schemes are then given for computing the various sufficient or necessary conditions for instability established together with Professor J.A.C. Martins Finally, the stability analysis and the computation of flutter solutions are carried out for two examples: the sliding of a Polyurethane block on a plane and the squeal of a rubber waist seal sliding on a car window. In Section 1, a variational inequality formulation and numerical methods for solving quasistatic problems in elasticity are briefly recalled. Details can be found in a previous CISM course volume (see Raous (1999)). This approach is extended to dynamic problems in Section 2. The formulation is written in terms of differential measures in order to deal with the non-smooth character of the solutions. It is an extension of those developed by J.J. Moreau and M. Jean. In Section 3, the above formulations are extended to hyper-elastic problems and a method for computing directly the steady sliding solution is given. Numerical analysis of the stability of quasistatic solutions in the context of linear elasticity is carried out in Section 4. The example of the sliding of a Polyurethane block is studied. In Section 5, the stability analysis is carried out for a steady sliding solution in the context of hyper-elasticity and used to characterize the squeal of a waist seal sliding on a car window. This work has been conducted within an International Program of Scientific Collaboration (PICS) between CNRS and JNICT with Professor J.A.C. Martins (IST — Lisbon) involving the theses of S. Barbarin, D. Vola in Marseille and the one of A. Pinto da Costa in Lisbon. The study on the waist seal presented in sections 3 and 5 has been supported by Renault.